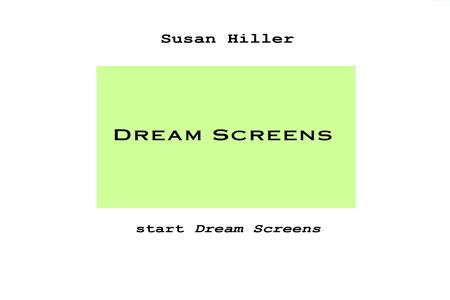 Dream Screen is a work of Net art, available online showing a large monochrome hue, with a selection of many available languages at the bottom of the screen. 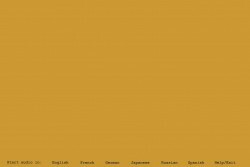 Texts are recited in the choosen language with a repetitive noise in the background: that of a human heart, that of the words “I’m dreaming” transcribed in Morse code, that of a radio image of a pulsar signal. Each narrative fragment heard is connected with dreams, whether memories of individual or collective dreams, excerpts from books or films, theories about dreams, or even reflections on art history. The texts and sounds are superposed, blended to the point of being occasionally impossible to follow. This work plays with the paradox of how screens are used, usually full of constantly refreshed texts and images, and what is presented here in that flat, monochrome hue. Browsing happens without an objective, wandering, focused uniquely on the emotions produced by the colors, detached from any search for information. The narrative fragments and the sounds presented in the background create a juxtaposition of individual and collective narratives, past and present theories, internal and extraterrestrial sounds. The individual and spatiotemporal markers are blurred, making way for the imagination and an interpretation freed from all rationality. Dream Screen provokes and explores the moment when we let ourselves get carried away in this almost hypnotic experience. The barrier between dreams and reality is permeable, the subconscious becomes accessible in the waking state. The work echoes the artistic event called Dream Mapping conducted in England by Susan Hiller in 1974, halfway between performance and scientific experiment, consisting in the establishment of individual and collective cartographies of participants’ dreams.